Vaido (Võrumaa, Estonia) on 22 December 2014 in Animal & Insect and Portfolio. I was looking for taking some photos of sunrise on a lake. Luckily I found a swan family enjoying the morning here, too. Wonderful, magical golden light. Beautiful image. You had great luck finding these beauties cruising the lake. A gorgeous image. brilliant composition, light and tones! just a beautiful morning mood! 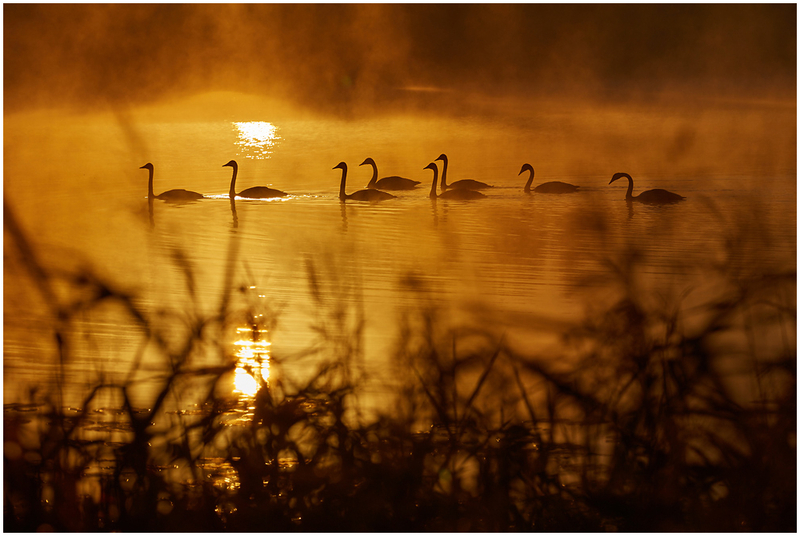 Stunning image ... the golden light and the silhouettes are magnificent !!! Très belle, félicitations à vous. Splendid . Congrats on the spot! Amazing golden scene !!!!! Outstanding composition and exposure !!! Congrats on this beautiful Spotlight !!! congratulations and merry christmas ! Congrats! Beautiful shot. Merry Christmas to you! elle est juste fabuleuse cette photo, quelle ambiance. Félicitations pour ce spotlight très largement mérité. Splendid, congrats. Happy Christmas !!! Mystical view..somewhere in the fantasy country ! So beautiful! !congratulations for the spotlight. It was deserving! Just beautiful. Another proof that great shots can be made just around the corner.